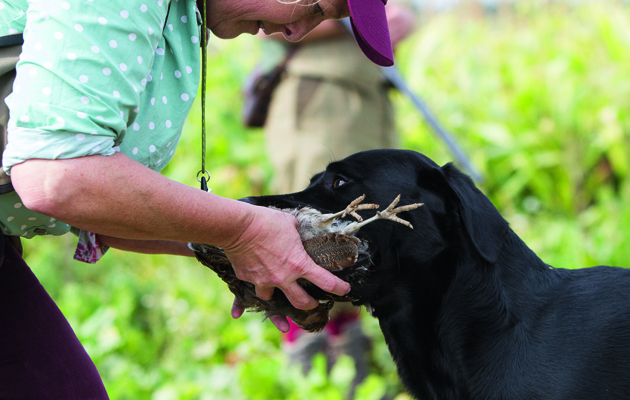 Kestrelway Gundogs in Gloucestershire offer 40-bird training sessions on their own shoot to both novices and expert handlers, as Nick Ridley reports. Norman and Sandra Onens of Kestrelway Gundogs are experienced gundog trainers and handlers and at their training ground, based near Evesham in Gloucestershire, they have developed a superb area for training not only novice dogs and handlers, but also dogs that are competing at field trial level. The ground is around 80 acres and planted with fodder turnips with strips of maize to break the cover into “bays.” Anyone that has worked their dogs in root crops will tell you that it is the most testing of cover and can cause problems for even the most experienced of dogs. At first appearance it looks quite easy for the dogs, but scent gets held underneath the leaf canopy and the dogs have to really get their noses down to work out where the retrieve is lying. 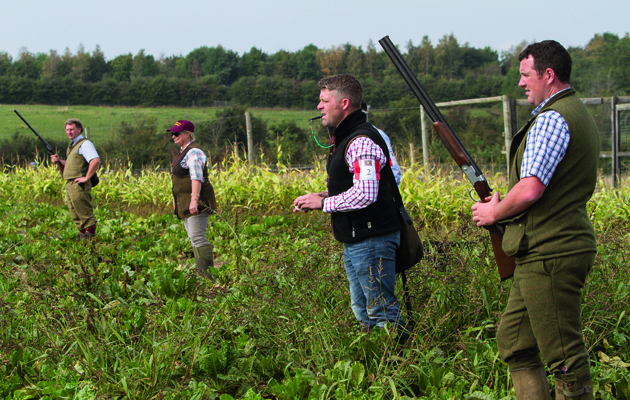 Unlike heavier cover, the biggest advantage of root crops is that the handlers can clearly see their dogs and, more importantly, inexperienced dogs can get good marks on any shot birds. The days are based around a traditional walked up day where the Guns, handlers and dogs all walk in line and the birds are flushed as the line walks up. The training days are run along the lines of a traditional walked up shoot day. The quarry is both grey and red-legged partridge and gamekeeper Will Taylor explained that the birds are all reared from day olds and released during August before being held on the ground by near-constant dogging in. 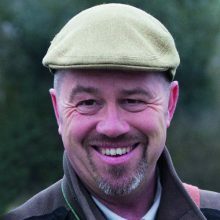 The management of the ground and the game is remarkable and it enables the team at Kestralway to run two 40-bird training sessions per day for six days a week during September and early October. They then reduce the bag to 20 birds six days a week as the season progresses. These training days are all about the dogs and not necessarily about the shooting. The Guns must understand that for the benefit of the handlers and their dogs they need to get “birds on the ground” as well as the patience to stand and watch while a dog is out on a retrieve. There is one other added pressure and that is when a covey of high velocity partridges starburst from underneath a canopy of fodder beet leaves. They are no easy target, there is no time to make sure your footing is right, it’s a case of mount your gun, slip the safety catch and pull the trigger – reflex shooting at its best. Handlers and their dogs participate in these training days for a number of reasons. For Astrid Lever and her black Labrador “Otto” it is a case of gaining more experience and learning the handling skills to enable them to compete in field trials. Astrid has come to gundogs slightly later in life, as she spent 23 years as an international air stewardess. After retiring, she had the time and opportunity to take on her first fully-registered Labrador pup (which incidentally was bred by Norman and Sandra) and she has been well and truly bitten by the gundog bug. Astrid explained that she had just had a run in her first novice trial and although she enjoyed it she was very nervous. This went straight down to the dog and unfortunately they didn’t last very long. She came to the training day with set goals in mind and one of those was to make sure Otto stayed tight at heel, which is a requirement for a retriever during a walked-up day, and something that Otto hadn’t performed to the best of his ability during his first trial. Walking in line, keeping your dog in the right place and also watching and making sure you get a good mark on any shot birds are all skills that need to be developed and honed and Astrid is very clear that the best way to develop these skills and grow her own confidence is to attend this kind of day and to have the chance to replicate and correct any training issues under live conditions. During a walked up shoot, birds tend to be shot at a closer range than during a driven shoot and to make the retrieves more testing the dogs may well be sent from the opposite end of the line, hence the reason the handler has to make sure they get a good mark. It is also very important that you get some kind of reference point as it is very easy to lose your mark in root crops when it all looks the same. Astrid’s highlight came later in the afternoon when a partridge was shot by the furthest Gun, which made it a good 70-meter retrieve for Otto. As soon as he was sent it was obvious he had marked the bird and to watch a young dog run in a perfectly straight line, hit the fall, pick a bird and deliver it to hand really is a joy and Astrid was rightly very pleased. Astrid take a perfect delivery from “Otto”. Former Super Bike champion Marcus Langford bought and began training his first Labrador “Goss” after retiring from racing. Quite naturally, Marcus has a competitive streak and acknowledges just how important it is to both him and Goss that they attend these training days. This day, Goss and Marcus gained some vaulable experience when a partridge was shot and dipped over a hedge, unsighted to both dog and handler. Will took them both out to a track and gave Marcus a rough mark, although in truth he could only point them in the general area. It was going to be a difficult retrieve and Goss would naturally want to follow the track although it was thought the bird had landed in the field off to the right. Marcus took the wind direction into consideration and cast Goss slightly left-handed. As predicted, the dog headed down the track, but as he got to about 80 meters he just lifted his head and took an air scent over the field to the hedge line. I know as a dog handler it is so tempting to stop the dog and put it back to where you think it should be working, but in this case Marcus let the dog use its nose and its natural instincts and as Goss appeared from the depths of the hedge with a very lively runner it proved to be the right decision. It was a really great retrieve and one that Marcus would hope to achieve at some point in a field trial. The day was never rushed and there was plenty of experienced advice on hand. It was noticeable that no-one was ever put under pressure to get a retrieve done quickly. It took as long as it took and as Norman kept reminding people – it was a training day. 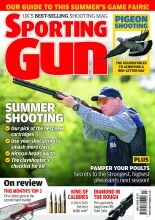 A 40-bird day costs £960 (£24 per bird) and this cost is split between the Guns and dog handlers. On this particular day there were four Guns and six handlers, so it worked out at around £96 per person. Believe me, that is very good value considering the valuable experience that can be gained in a relatively short time!